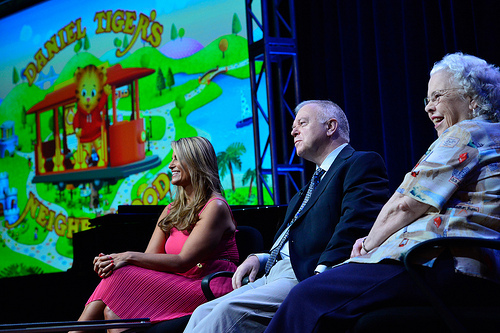 This weekend's PBS Press Tour at the Beverly Hilton was a must-attend event for more reasons than one. In addition to attending the fabulously funny Downton Abbey panel and reception, checking out Ken Burns' new documentary on the Dust Bowl and seeing Martha Stewart make an omelet in person, I also enjoyed a panel introducing a little tiger named Daniel, whose new show, Daniel Tiger's Neighborhood, was inspired by a famous character from my own childhood, Mister Rogers. Daniel Tiger's Neighborhood, which premieres on PBS Kids on Sept. 3, is a new series from the Fred Rogers Company, about 4-year-old tiger Daniel, who is the son of the original show's Daniel Striped Tiger. Through his family and friendships, Daniel shows preschoolers how to navigate the social-emotional issues that come with being a young child. And he also does it in song! I had the chance to chat with Angela Santomero, the series creator and executive producer, and executive producer Kevin Morrison after the panel (which also featured Mrs. Joanne Rogers, widow of Fred). "The one that I think of is when we moved you to tears," Santomero said, referring to Morrison. Morrison then reflected on getting teary-eyed when they were working on the closing song. "It's interesting. I didn't ever meet Fred (Rogers)," said Morrison, who is based at the Fred Rogers Company in Pittsburgh, Penn. "I joined a company that had been working with Fred for most of the staff's lifetime. I was heard occasionally to accuse them of being a cult," he added, jokingly. "And it wasn't that I didn't profoundly respect what Fred had done, because I did," Morrison said. "I had a huge respect for him, but I didn't think of him as a sort of holy person. The more you get into his work, the more you get to know him through the people that he influenced, the more you just think, this was a very special person." "I'm not given to tears," he continued, "but we did just get to that point in post-production where we were looking at the final version of the end song, and I just thought, 'I'm all teary-eyed.'" "We did 'It's Such a Good Feeling,' so it's a new version of Fred's original 'It's Such a Good Feeling' song," Santomero said, "and we see Daniel walking through the new neighborhood of make-believe, and he bumps into each one of the characters little by little as he's going down the street, so it's kind of our version of the 'Bonjour' song in Beauty and the Beast." "Another (surprising moment) that I think that we tend to overlook, because it happened so organically," added Morrison, "was the development of each one of these characters to become real characters, and it's a combination of the work that goes into it by the artists, drawing those characters and then animating them, and you're seeing them moving around as real people, whereas they've just been sketches up until now, and the quite extraordinary voice talent..."
"And the wonderful writing," Santomero added. "The characters suddenly come to life in a way that is just a constant joy," said Morrison. "It is what sets us apart from all the other shows because we do tell these stories that are nicely intertwined, and then across the series you can appreciate it because you can watch the characters grow," Santomero said. "So I keep joking that it's Friends for preschoolers."